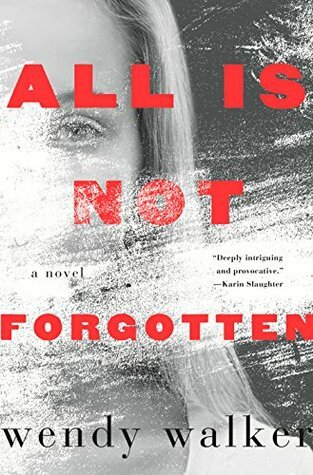 All Is Not Forgotten by Wendy Walker is a novel filled with a lot of mystery and suspense. However, firstly just a warning, this book contains graphic sexual content. It begins with Jenny Kramer, a 15-yr-old girl, who is brutally raped and assaulted one night when she is out at a party and heads off into the woods after drinking a little too much alcohol. Directly after the attack, she undergoes a new treatment to remove any trace of the harrowing experience from her memory. It works, but Jenny struggles with the mystery of not knowing what happened that horrible evening, finding it almost too much to bear. She becomes a client of psychiatrist, Dr Alan Forrester, (he is the narrator of the story). He treats Jenny, as well as her parents (and a few other characters too). Using various methods, Dr Forrester tries to help Jenny uncover what went on, and who it was that caused her harm. By doing so, we are introduced to various characters, all of whom may or may not have had some involvement on the evening of Jenny's attack. I don't want to reveal too much, but I will say that this book really held my attention the whole time I was reading it, and I think that it is written brilliantly. Even though the focus of the entire story is on Jenny's attack, which at times doesn't make easy reading, there are a lot of twists, and it is certainly entertaining. I stayed up late turning the pages because I was really drawn to the story and wanted to find out who Jenny's attacker was. The ending threw me a little, and even days later, I still can't make my mind up about whether I liked the way it ended, but that could just be because it wasn't what I expected was going to happen. Nonetheless, it's a clever ending. I'd highly recommend this book, especially for those readers who enjoy dark, intriguing stories. I'm really interested to watch the film version when it is released to see how it will compare with the book. I was given an uncorrected proof copy of this book through http://beautyandlace.net/ in exchange for an honest review. Hi Di, thanks for your kind words! I try not to give too much away when I review books (which is often easier said than done! ), and yes, this one was very intriguing to say the least! Well, you've got me intrigued! Thanks for sharing! It sounds like a good one. Thanks also for joining the Lovin' Life Linky! Again I couldn't read this myself (I need fun and light rather than dark and murky) but I think if a book still has you pondering and musing days after it's finished, it must be a good book.